First, apologies for not blogging for so long, I did end up in hospital again (the vegan food as outstanding as ever) and have been slowly recovering at home here. Anyway, back to business! I know these don't look pretty at all - they didn't turn out the way I wanted. I had envisioned little sponge cakes baked in my mince pan, spread with jam on top then topped with a pretty piped swirl of vanilla buttercream. Well, the bottoms were too soft after baking so when I tried to remove them all the tops popped off! So they had to be filled instead and put upside down as the tops were firmer than the bottoms, hence their strange appearance! 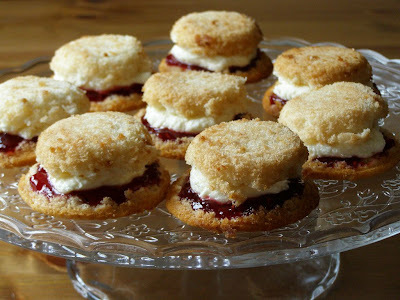 Doesn't matter though as they are so, so good, the raspberry jam going so nicely with the buttercream, lovely with a cup of tea! This post is more of an idea so no real recipe - I used a cake mix replacing the egg with sparkling water but any vegan white cake recipe would do. Then just spread with raspberry jam and some vanilla buttercream - I used Vegan Cupcakes Take Over the World's recipe here.